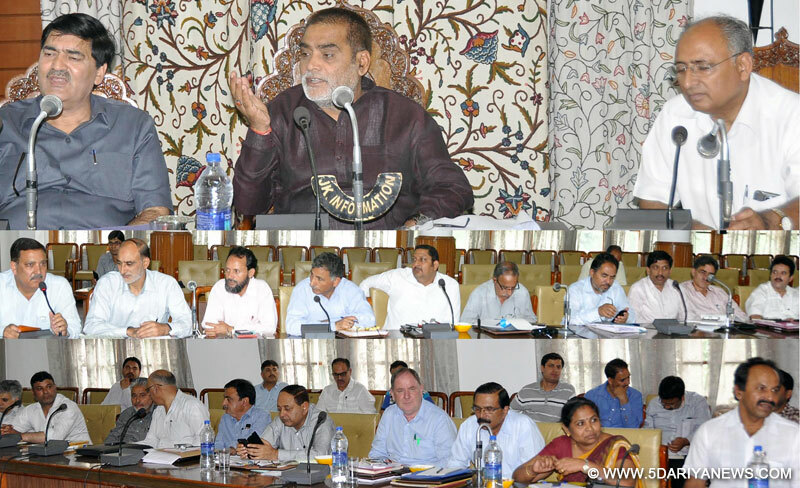 To review the implementation of National Rural Drinking Water Programme (NRDWP) besides annual plan of PHE departments of the State, a high level meeting of officers was today chaired jointly by the Union Minister of State for Drinking Water and Sanitation (DWS), Mr. Ram Kripal Yadav and Minister of State for PHE, Forest, Animal Husbandry and Irrigation & Flood Control, Mr. Abdul Majeed Padder at Banquet hall here today.On the occasion, the Secretary, PHE and Irrigation & Flood Control, Mr. Parvez Ahmad Malik, Chief Engineer, PHE Kashmir, Mr. G M Bhat, Joint Director Planning, Syed Shabir and all Superintendenting and Executive Engineers of Kashmir province, besides representatives of departments of Drinking Water and Sanitation of Union Ministry were present in the meeting. The meeting discussed various issues and matters pertaining to the implementation of National Rural Drinking Water Programme and annual plan of the State besides the damages caused to the infrastructure of PHE in the State. The meeting also took stock of restoration measures taken for restoration of flood-affected infrastructure. The Union Minister was informed that despite of last year’s flood devastation in the State, 640 habitations were provided drinking water facility by implementation of various water supply schemes against the target of 793 habitations by expenditure of Rs 458 crore. The Union Minister appreciated the efforts of the State authorities for achieving 88 percent of the target despite the fact that the last part of the year 2014-14 was not work worthy because of floods. The meeting also discussed the current annual plan (year 2015-16) of PHE sector amounting to Rs 539 crore targeted to cover 1516 habitations of the State.On the occasion, the MOS for PHE and Irrigation & Flood Control, Mr. Abdul Majeed Padder impressed upon the Union Minister and representatives of Union Ministry of DWS to approve the State annual plan as soon as possible so that targets are achieved on time and people are provided adequate drinking water facilities besides scarcity of drinking water is decreased.Later, the Ministers visited various water supply schemes, filtration plants and water quality laboratories.